The Minnesota Multiphasic Personality Inventory-2 (MMPI®-2) is the most widely used test in the world for personality assessment. To use it properly, professionals need an authoritative source of advice and guidance on how to administer, score, and interpret this test. Now thoroughly updated to reflect the latest research and literature on this test, Essentials of MMPI®-2 Assessment, Second Edition is that source. 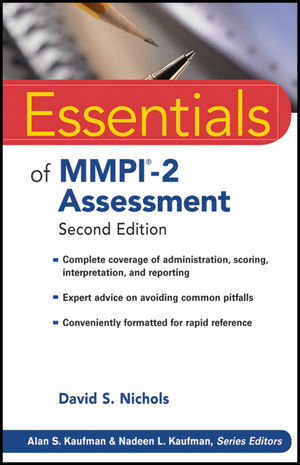 Essentials of MMPI®-2 Assessment, Second Edition adds new material on the MMPI®-2 RC and the MMPI®-2 RF, providing step-by-step guidance on test administration, scoring, and interpretation. Additionally, the author provides his expert assessment of the test's relative strengths and weaknesses, valuable advice on its clinical applications, and several illuminating case reports. David S. Nichols, PhD, worked as a staff clinical psychologist for Oregon State Hospital in Portland for twenty-seven years. He has conducted research on and written about the MMPI® for more than thirty years.